In a pan, make the butter melt. In a mixing bowl, sift the flour, the baking powder. Add the melted butter, the sugar and vanilla sugar. Mix until soft and then add the eggs. Beat until the dough is smooth. Spoon the batter into cupckes case and bake for 25 minutes. Once baked, let the cupacakes cool dowm completely before adding the icing. How to make the vanilla buttercream? Beat the butter and icing together. Add the milk a little bit after and the vanilla extract. 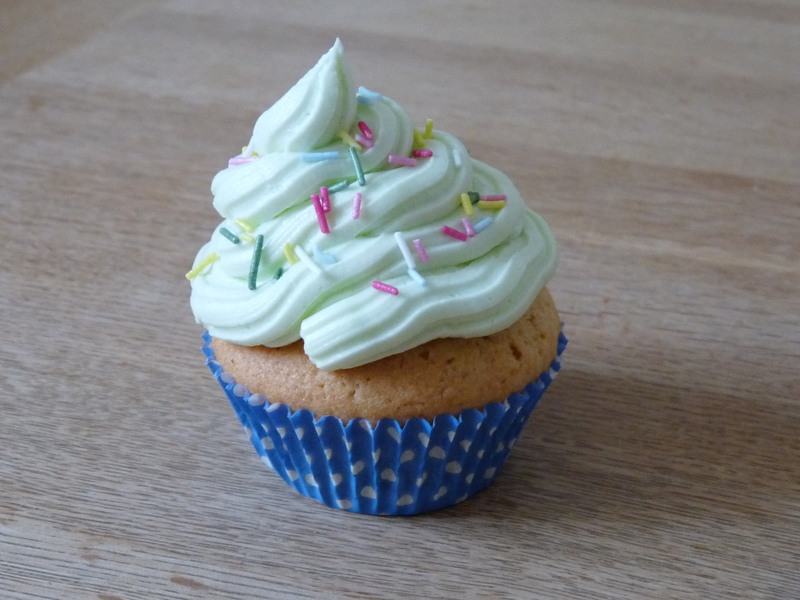 If you want to give a color to your buttercream, add the food colouring. Fill a pastry bag with the buttercream and decorate your cupcakes as you wish following your inspiration! This entry was posted in Cupcakes, Recipes and tagged basic cupacakes, vanilla buttercream, vanilla cupacakes by thebloodyfrog. Bookmark the permalink.